This is a transcript of a demonstration I gave in our company internally about async/await "challenges" in UI programming. YOu can find the accompanying repository in my repository on Github. The form contains three buttons which are intended to download the the content from http://microsoft.com asynchronously and show it in a TextBox. 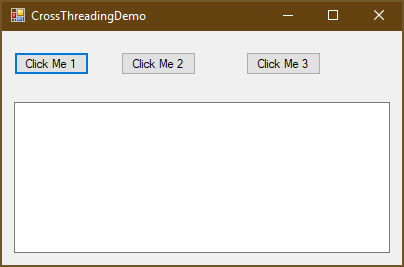 Cross-thread operation not valid: Control 'textBox1' accessed from a thread other than the thread it was created on. That's because in Win32 UIs you must access controls from the same thread that created them. Because the after awaiting SomeSlowAsyncOperation the method continues not in the main thread but a nackground thread, accessing textBox1 is forbidden. When you debug button1_Click, pay attention to the Threads tool window. Entering the method, you'll be on thread #1, the main thread. After calling SomeFastAsyncOperation, the code continues on thread #1. That's because the method returns an already completed task, so the code can continue synchronously. The property textBox1.Text will be set in said background thread and fail, because Win32 controls mist be accessed from the same thread that created them. Clicking the second button will freeze the application. The GetAwaiter().GetResult() invocation will try to re-enter the the main thread, which is waiting for the task, so we'll run into a dead-lock. Using the JoinableTaskFactory from Microsoft.VisualStudio.Threading (NuGet package here), we are able to "switch" back to the UI thread. I won't go into details of how async/await works. Basically, the compiler generates a state machine, which Dixin explains pretty good in his blog serie Understanding C# async / await (1) Compilation (Part 2, Part 3). (actually, in the thread with instantiated _joinableTaskFactory). As you could see, Microsoft.VisualStudio.Threading makes asynchronous programming in desktop applications, both WinForms and WPF, much simpler. BTW, I've learned a lot reading the code of that library. It provides much more async helpers like AsyncEventHandlers. In my current position as the Technical Lead of Product Development I have several responsibilities. One of them is the definition and implementation of our development processes. We're using Team Foundation Server, which supports rich customization of the process configuration, especially the workflow of work items. To document the workflow of our work items, I wanted to create perspicuous charts. However, if you're a nerd like me, you don't want to use Powerpoint or Visio to create high gloss charts. Instead I like to automate the creation of the charts. On the other end, the Graphviz suite includes a nice small tool named dot to draw directed graphs as PNGs, reading the defintion of the graph from a text file. Liquid error: One or more errors occurred. Nevertheless, the script was written in a short time, it does what it should do without any error handling. However, it suits my needs. Maybe yours as well. Some time ago I reported a bug and provided a pull request to resourcelib, a managed library to read and write Win32 resources in executables or DLL's. And unawarely, the next morning I was a maintainer of that library. This blog post is about an issue we've received: someone tried to patched the Win32 resources of a setup.exe , an executable installer created with WiX. However, after changing the resources with resourdelib, the setup didn't work anymore. I've spent some time investigating this issue using dumpbin and reading the PE format specification. Because I don't know how good Google is at indexing Github issues, I'll also post my analysis here in my blog for reference. The original thread is here. TL;DR: to me it looks like WiX is doing it wrong. In a hex viewer you can see that after the last section, the file continues for another 104205 bytes, starting with 0x4D 0x53 0x43 0x46 (MSCF, the magic number starting a cab file). I patched the StringFileInfo resource using resourcelib, which changed the content of the .rsrc section only. Afterwards the file ended at 0x000715FF, i.e. the following 104205 bytes were missing. the .wixburn section points to 104,205 bytes (102,034 + 2,171), starting at 0x00071600. the last PE section ends at 0x000715ff. after using the official Win32 API to edit resources, the file ends at 0x000715ff, and the following 104,205 byte are gone. So after editing the resources, the exact payload WiX is referring to is eliminated. As far as I understand the specification, this procedure is not compliant with the PE format. That might be the reason why EndUpdateResource cuts the file after the last section when writing the changed resources. From the beginning NuGet used a per-solution folder packages to store all packages for the projects in a solution. (Does anyone else remember the numerous discussion whether that folder belongs into the VCS or not?). With Project.JSON managed projects, there is now a packages folder that is shared for all projects that you work with. Packages are downloaded and stored in the %userprofile%\.nuget\packages folder. This means that if you are working on multiple UWP projects on your workstation, you only have one copy of the EntityFramework package and its dependencies on your machine. All .NET projects will acquire package references from this global shared folder. This also means that when you need to configure a new project, your project will not take time starting so that it can download a fresh copy of EntityFramework.nupkg Instead, it will simply and quickly reference the files you have already downloaded. ASP.NET 5 uses the %userprofile%\.dnx\packages folder and as that framework nears completion it will use the %userprofile%\.nuget\packages folder as well. Well, I didn't pay much attention to that change, until I ran out of disk space last week and used WinDirTree to find the culprit. Indeed, the size of my packages folder was more than 6 GB. Don't worry that you could delete a package which you would need later again. NuGet will just download the missing package again. wouldn't delete a single byte but log which folders the script would remove. I've published a couple of posts about that I'm using Pretzel to generate the HTML pages of my blog. However, I didn't talk about the hosting. Actually, it's quite simple: The source files for the site are hosted in a git repository on GitHub. The generated site is hosted in Azure. Whenever I push changes to the git repository, the web site will be updated automatically. The setup is a two-stage process: first, you have to create a Azure App Service and connect it to your git repository. The steps involved are documented very well in Continuous Deployment to Azure App Service. The second step is to execute Pretzel on the Azure side. Enter Kudu. Kudu is the engine behind git deployments in Azure. It's well documented in the wiki at GitHub. By default, Kudu will locate the relevant csproj file, compile it, and copy the artifacts to wwwroot. That's why many web sizes running on Azure contain an empty "shim project". bake is the Pretzel's command to generate the files, and the destination folder is %DEPLOYMENT_TARGET%, which is the wwwroot folder. That's all. Whenever I push changes to the git repository, Kudu will get the current files, execute Pretzel, and the updated web site is public. The whole process takes less than a minute. Of course this can be adapted to any other static site generator too, e.g. Jekyll.